It wasn’t easy. I think if I knew just how much work it would be, I might have stopped it before it began. Bringing 2 kittens into a house ruled by dogs does not sound like a good idea. But my son played me like a drum set, pounding me with emotional arguments until I relented. I read up on introducing cats and dogs. I prepared a “safe” room where the kittens would start out: our recently finished basement, complete with carpeting, couches, kitty beds, central heat and a litter box just like the one they were used to. 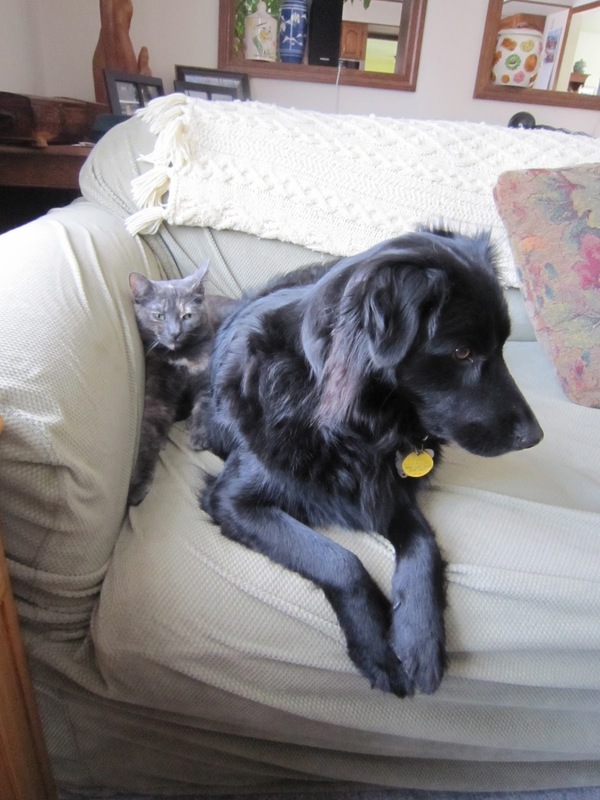 We specifically chose two siblings--kittens from a rescue organization that were friendly, outgoing, not too skittish--and were fostered with dogs. We hoped they would amuse each other. At first, Dawn and Athena were kept in their basement safe room, and they would come up the stairs and sniff under the door. From the other side, Jasper and Lilah would inhale great gulps of cat. We put a gate at the top of the stairs and left the door open so they could see each other. But the cats would scatter and disappear from view at the sound of the dogs galumphing around the house, so none of the animals actually saw each other at first. It was just smells and sounds. We had to force the issue, putting the cats in the dining room for an hour or so every day and putting gates up in the two entrances to the room, so the animals could see each other. My kids took turns in the dining room with the kittens, playing with them while I and my husband--or whoever wasn’t doing dining room duty--took up posts at each gate, armed with containers filled with dog treats. At first the dogs galloped back and forth to each gate, sending the kittens scampering for cover under the buffet. Jasper and Lilah were given the Down command, and were rewarded for responding, as well as when they relaxed or looked away from the cats. At night, when the dogs went to our bedroom with us, my kids let the cats have the run of the house, so Dawn and Athena could familiarize themselves with the best hidey spots and be comfortable outside of the dining room. 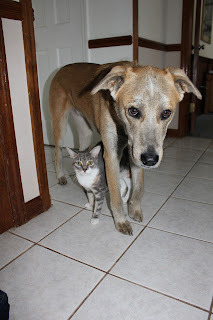 When we saw that the dogs were getting used to the kittens during Dining Room Time, we lifted the gates a few inches off the ground so the cats had room to slip under to get out or back in, but the dogs couldn’t follow. Jasper and Lilah were leashed, with each dog attended by a human. Each dog attendant also held on to a squirt bottle and a bunch of treats. Then we just watched and waited. It usually took just a few minutes, and either Dawn or Athena slipped under the gates, and began running around the house, followed (well, almost chased) by dogs with people attached to their leashes. This is when the dogs got a lot of practice with the Leave It command. Leave It means whatever the thing is that you’re interested in, too bad, leave it alone, whether it’s food, a Bit, a toy, an interesting smell...or a cat. Which might seem like a really hard thing to do, but treats were freely given for compliance. And in Jasper’s case, a squirt with the water bottle for noncompliance. It became an easy choice. All of this took place over time, with incremental changes in freedom and exposure for dogs and cats every day, and with everyone supervised--and treats and squirt bottles kept at hand. After a while we were able to take off the leashes. We left gates up with spaces at the bottom in the dining room, and in the basement doorway, so that Dawn and Athena could always find an escape route. I think the hardest thing for Jasper and Lilah to learn was not to join in the Kitty Crazies that would happen randomly during the day. All cat owners are familiar with the Cat As Pinball phenomenon that causes felines to zoom around the house bouncing off the walls and careening around until they suddenly stop and begin licking themselves with a studied nonchalance. To Jasper and Lilah, speeding kitties are inviting a chase, and it took many treats (and a few squirts) for them to realize, this was Not a Dog Game. Cats Only. Best to keep your head low and stay out of the way. 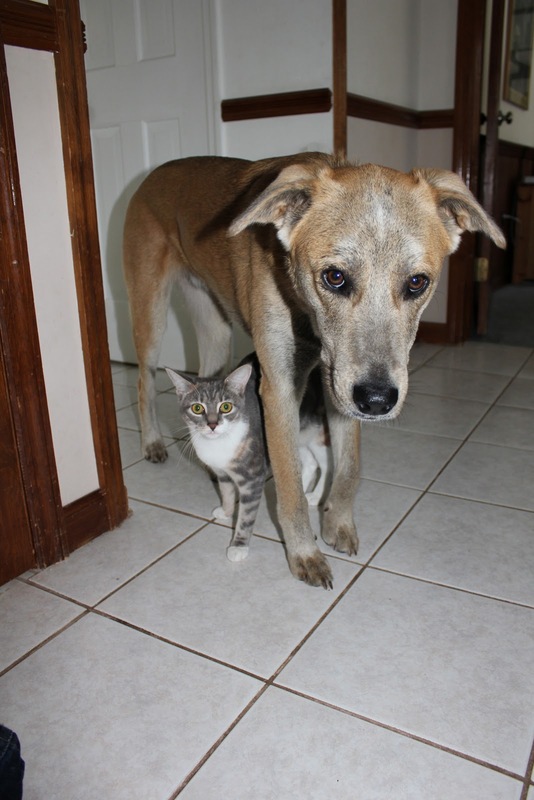 Today, cats and dogs are living in...well, if it’s not harmony, then it’s pretty close. The cats nuzzle and rub up against the dogs. I’ve even heard Dawn purr when she cozies up to Jasper or Lilah. Kitty Crazies take place as always, with Athena leaping over Lilah and Dawn flying past Jasper, mere inches from his nose. 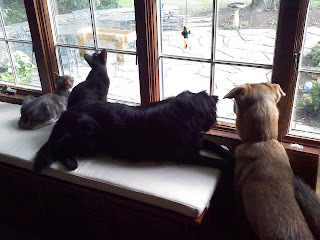 They all share an interest in Watching Birdies, and it is sometimes a group activity. Lilah, whom we’ve always felt was part cat, likes to play with some of Dawn and Athena’s toys, pulling on shiny string, pouncing on a mousy or chasing ping pong balls. Sometimes, I’ll throw a ball and 2 cats and a dog will go running after it. Lilah and Athena sharing space on the couch. Peaceable Kingdom. And okay, I will admit. It was totally worth it.